In this personal report, Mira Turpeinen from Finland – our three times participant – writes about her experience with the summer school. Why does she think this summer school is unique and why would she come (again)? How to build an academic summer school? Usually this requires at least three elements: people, venue and academic program. However, this does not tell much about how to build a good summer school, not to mention a great one. In this brief report, I will explain why Common Law Society, in my opinion, succeeds in building not good but great summer schools each year. I have been fortunate to participate in three of them (years 2012, 2013 and 2015). These years have only reinforced my perception that, in order to build a successful summer school, it does matter how one structures and combines different elements together (people, venue, program). Therefore, using a metaphor – as we are advised in our moot court exercise – the CLS summer school succeeds because it builds a house or more like home in which one not only learns but also truly enjoys this learning experience and to which one wishes to return. Moreover, all this is done without compromising with the quality of learning. How do they manage this task year after year? I will begin with people, as it forms the foundation of the house as far as the CLS summer schools are concerned. The heart of the summer school is the organising team, which indeed works as a team devoted to help the participants of the summer school to make most of their experience, whether it means picking us up from the bus stop or getting our favourite chocolate from the local shop. I believe most, if not all, past-participants of the summer school would subscribe that the CLS crew has been able to create an inspirational yet a casual atmosphere in the summer school where the students may concentrate on the lectures knowing that everything will work and is taken care of. As the days are long with stimulating academic program, the organising team is wise enough to balance the studying with free-time activities and remind us that a few blueberry dumplings will only improve our argumentation in the next day’s lectures. Of course, the CLS crew also chooses the other people (participants and lecturers) to the summer school and, being inspired by the CLS team, this has every year resulted in a bunch of people from different countries working and spending time together inside and outside lectures for two weeks. So, if people are the foundation of the house, then the venue is its walls that keep it all together. 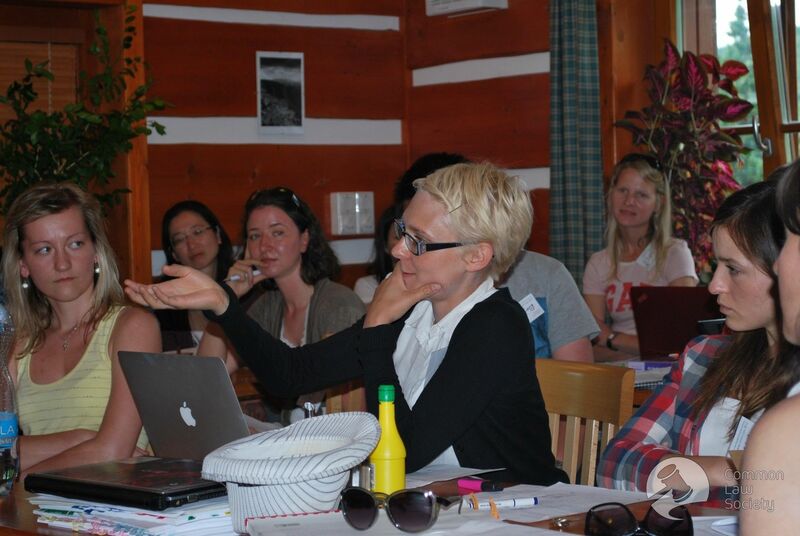 One unique feature of the CLS summer school is the fact that it is held in the mountains. Why does this venue matter? First of all, one cannot deny that being placed in the Giant Mountains would not boost your creativity when you are surrounded with such a beautiful nature, including brilliant hiking activities. However, the venue has another important function – bringing and keeping the participants in the same place for two weeks. This generates a feeling of cohesion, which would be harder to reach, I would guess, if the summer school were organised in a city in which the group becomes more scattered. Indeed, the feeling of togetherness is bound to happen after sharing a room with 3-4 persons. However, as I still keep contact with my old roommates from the first year and I have studied abroad with some other participants, I would say that sharing a limited space grants you an opportunity to get to know and form friendships with other participants, who may be, who knows, possibly your colleagues in the future. Last, but by no means least, I should pay due regard to the academic program, because, in the end, we spend most of our time in the lectures. It is hard to keep this section brief without doing injustice to so many great lectures which I have been able to attend during these years. Indeed, the lecturers have every year provided the house with a high-standard roof - somewhere to aim for. However, even though they teach students in the prestigious universities, such as the LSE or Oxford, many lecturers have been amazed by the amount of questions and participation from the CLS summer school students. In fact, during the years, I have heard more than once from the lecturers that the CLS summer school was one of the best, if not the best, teaching experience they have had. I can also subscribe to this statement from a student point of view. First of all, the lecturers have presented us with high-quality teaching guided by updated reading materials, whose height, if piled together, do not much pale next to Sněžka (which is Czech’s yet not Slovakia’s highest mountain, as you shall learn). Yet, one should not be afraid of the amount of reading because from these materials we usually construct the lectures together. Moreover, generally, the aim has not been to indoctrinate us, for instance, with European law scholarship but to debate, argue and problematize challenging European law issues. In other words, make us think ourselves. This is, or at least should be, self-evident in academic environment. However, in practice, it is not always so easy to get students to debate, argue and problematize, especially if the group consist of students not only from different stages (bachelor, master and doctoral students) but also from different countries (also China and the US have been represented). Yet, many lecturers are positively surprised with the active response of their audience in the Giant Mountains. The reason behind this active response is the fact that the venue and the organising team have created a casual, safe and fun atmosphere which invites you to develop your argumentation and knowledge by working together. This only culminates in a moot court exercise at the end of the second week. It might also help that after the lectures one can continue “debating” in ping-pong, volleyball and football (of course, with fair play in mind) or have a drink with the lecturers and other participants or, why not, have a barbeque evening with one of the judges of the CJEU. This all brings me to my starting point: the CLS summer school surely knows how to combine different elements to build a house which feels like home and in which everybody learns and enjoys their time in the process. Maybe the best recommendation I may give is the fact that I have not been nor will I be the only one who has returned or wishes to return to the Giant Mountains. And this tells much about how to build a great summer school. academic summer school? Usually this requires at least three elements: people, venue and academic program. However, this does not tell much about how to build a good summer school, not to mention a great one. In this brief report, I will explain why Common Law Society, in my opinion, succeeds in building not good but great summer schools each year. I have been fortunate to participate in three of them (years 2012, 2013 and 2015). These years have only reinforced my perception that, in order to build a successful summer school, it does matter how one structures and combines different elements together (people, venue, program). Therefore, using a metaphor – as we are advised in our moot court exercise – the CLS summer school succeeds because it builds a house or more like home in which one not only learns but also truly enjoys this learning experience and to which one wishes to return. Moreover, all this is done without compromising with the quality of learning. How do they manage this task year after year?